I love rocking a Wash-n-Go and will usually pull off the Wash-n-Go for a week (but this really depends on how my hair is feeling while it is out and “exposed” to the elements and how tangled it gets). I do this by simply refreshing my curls in the morning and doing the pineapple method at night. The initial day of “setting” my look is done on freshly washed hair after I have Cleansed, Detangled and Deep Conditioned my hair- (refer to my Wash Day Routine tab). After washing my hair I simply apply my DIY ‘creamy Leave-in’, seal my ends and use a little Flax Seed Gel (FSG) that is it! This is another reason why I like doing this look. It is so so simple! I moisturize, seal and set. All three recipes can be found under my Hair Routines tabs. In order to maintain my Wash-n-Go over the week I freshen up my curls every morning. If my hair is not too frizzy or dry I spritz with my spray leave-in and seal with my mixed Oil. When my hair looks very frizzy or feels dry I first spritz with plain water, use coin sized amount of my creamy leave-in per side and seal with my Oil mix. Below is an image explanation along with descriptions of how I freshen up my hair. 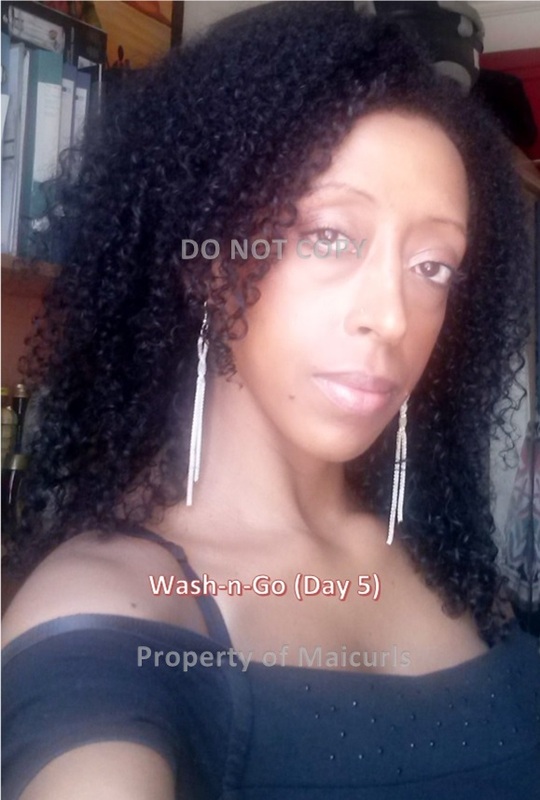 In this example I use my Creamy leave-in for my day 5 Wash-n-Go. I use the pineapple method at night and use a scarf to protect my hair. In the morning I take off the scarf. Take my hair down and shake my head. It helps to get my hair to hang down. I start to arrange where I would like my hair to lay after shaking my head. When my hair is feeling a little dry I first use my plain Water Spray Bottle to lightly coat my curls. I start to distribute it by running my hands down the entire length of my hair. Next I use my DIY Creamy Leave-in. It helps to tame my frizz and moisturizes my hair. I use about a coin sized amount per section (2 sides and the back). The final step is to use my Mixed Sealing Oil. I first seal towards the ends of my hair using about a few drops of my mixed Oils per side. I run my hands down the ends of my hair (two sides and the back). I rub the rest of the Oil on the rest of my hair. I try to avoid my scalp to avoid build-up. That is it! As I explained if I do not have too much frizz and my hair is not feeling dry then I use my light Leave-in Spray (instead of water) and skip the Creamy Leave-in and finish by sealing my hair. What is your Wash-n-Go routine? I use shampoo (Aveda or Ouidad)with conditioner , Mixed Chicks Leave-in and Chi oil to seal during the summer (before finding your YouTube DYI’s, it may change), Now, in the winter, I’m using clay to cleanse, aloe/glycerin mixture to close cuticles, Mixed Chicks Leave-in and Henna/Shea Butter along with Henna/Fenugreek strengthening oil to seal. I’m doing twist-outs now as well.